Alpio Barbara is a Californian who now spends most of his time here in the valley. 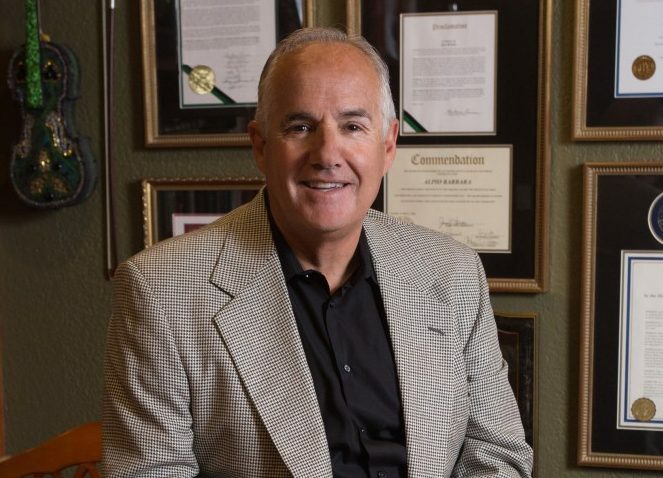 The owner/operator of Redwood General Tire in Redwood City, CA he was awarded Tire Dealer of the year by Modern Tire Dealer Magazine in 2016. Like so many successful entrepreneurs Alpio just couldn’t slow down so he has combined his personal passion and collection of automobiles with yet another business venture. 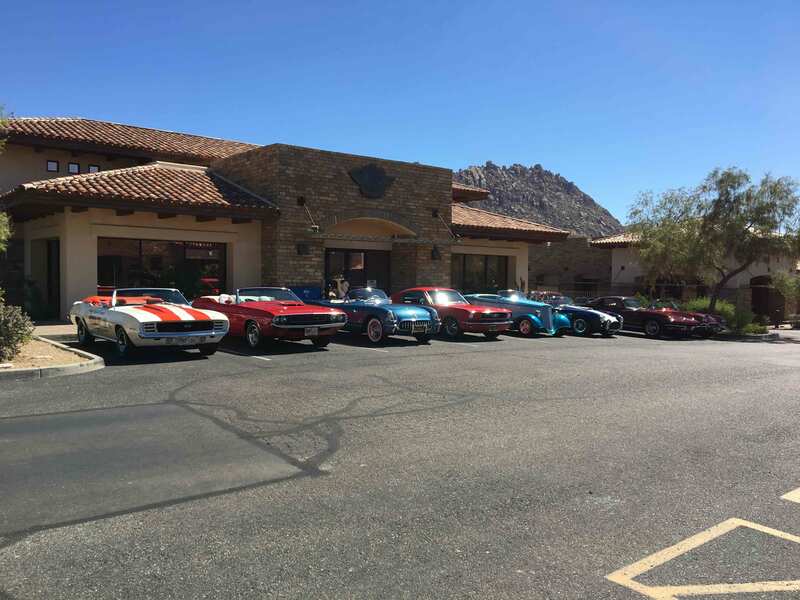 Needing a place to store and display his cars and motorcycles he bought a building in the Villages at Pinnacle Peak shopping center at Alma School and Jomax in the Troon development. He designed and built a classic 1950’s style diner with a dozen of his ever-changing collection of cars prominently displayed with a backdrop of life-size mannequins of the Rat Pack, Marilyn Monroe, Motorcycle Officers, Vintage Gas Pumps and more. Hanging from the ceiling are large-scale models of military aircraft acquired from private collections and period neon signs. Alpio was approached by people from clubs and organizations who heard about the place and wanted to rent it for themed events. 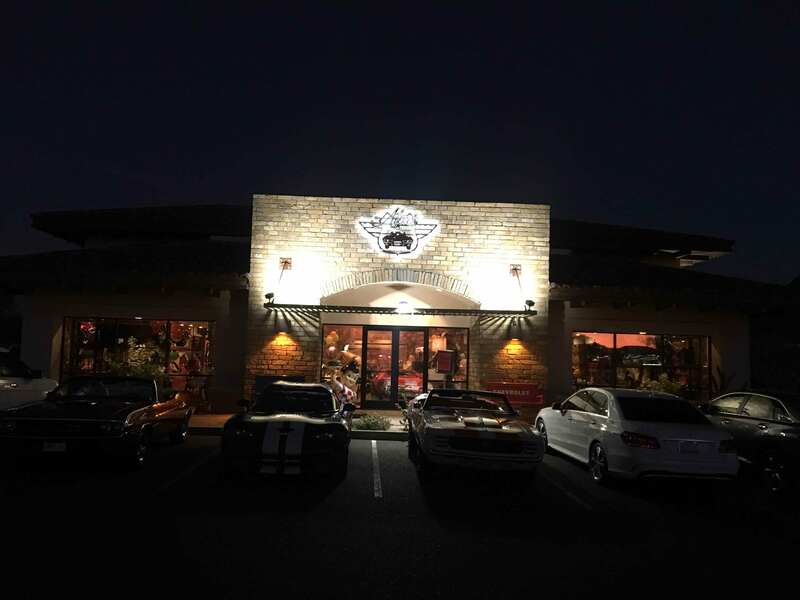 One such event was a Halloween Party for the Ferrari Club of Arizona. On another occasion, they took advantage of the 80” screen and audio/video system to hold a live screening of the US Formula 1 Race. A double mezzanine level provides lounge seating, pool table, video and pinball games. Alpio’s At Troon’s truly unique setting has been used for weddings, birthday parties, club meetings and parties, business and association socials, bachelorette parties, holiday parties and more. Alpio offers to handle catering or the renter can provide their own. On the second Saturday of every month he hosts a Cars & Coffee gathering which attracts a large gathering of high-performance, classic and collector cars. Join us for your birthday or bachelorette party, team building or conference. Introducing the most unique event venue in the greater Scottsdale area — Alpio’s At Troon! 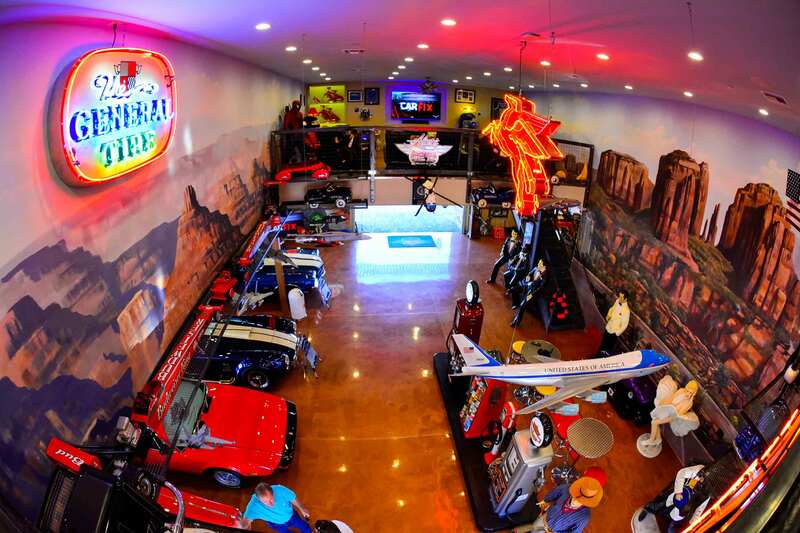 Surround yourself with classic cars and motorcycles, arcade games, pinball, pool table, Pac-Man. Alpio’s At Troon is a fantastic stage for your next event. Company parties and team building, fundraisers, reunion parties, alumni gatherings, birthday parties and bar/bat mitzvahs are celebrations that will bedazzle your guests when held at Alpio’s. From the blast of the past 50’s diner kitchen to a straight from the future 80” screen and AV equipment, you’ll find every amenity at Alpio’s. With beautiful classic cars, memorabilia, memorabilia, vintage gas pump, stunning murals, Alpio’s will be an experience you will never forget. Host your party of 2 to 150 at Alpio’s. Our experienced catering partners will make your event as fabulous as you want it to be.